Net Neutrality -- the principle that protects Internet users' free speech rights -- is censorship. Did you get that? You did if you happened to be reading the Wall Street Journal's editorial pages. Former Federal Communications Commissioner Robert McDowell recently wrote a screed claiming that Net Neutrality supporters have taken a turn "toward undermining free speech." And McDowell is not alone. Since the FCC announced its plan to make a new ruling regarding the open Internet, Washington has been overrun with phone and cable lobbyists whose sole mission is to convince the agency that real Net Neutrality rules are downright un-American. Industry-funded think tanks have argued that any enforceable effort to protect the open Internet denies phone and cable companies their First Amendment right "by compelling them to convey content providers' messages with which they may disagree." According to many industry spokespeople, the Net Neutrality protections that millions of Americans are fighting for are an "attempt to turn the Internet into... a federally regulated public utility." In the view of McDowell and others, Net Neutrality is bad for free speech because it takes away broadband providers' unalienable right to censor you. As an FCC decision on the matter grows nearer, the rhetoric from lobbyists will become even more extreme. If any of this sounds familiar, it's because Verizon's lawyers made a similarly distorted argument in 2013 before a federal appeals court, claiming that the First Amendment meant that Internet service providers were the Internet's editors -- free to pick and choose what content gets delivered to customers and what content ends up in a digital dust bin. The First Amendment "protects those transmitting the speech of others, and those who 'exercise editorial discretion' in selecting which speech to transmit and how to transmit it," Verizon's attorneys wrote in a brief to the court. "In performing these functions, broadband providers possess 'editorial discretion.' Just as a newspaper is entitled to decide which content to publish and where, broadband providers may feature some content over others." Did you get that? As a last-mile connection between its customers and the network itself, Verizon has the right to block any content that flows across the Web to or from its users. If this is beginning to sound Orwellian, that's because it is. For years now, phone and cable companies have likened the Internet to their private property, a domain over which they have ultimate say. Under this scenario, Net Neutrality violates the phone and cable companies' rights as "individuals" -- none being more sacred than the right to free speech (or, in their view, the right to throw all other speakers off the front porch). What's lost in this spin is this: The Internet is not the private property of AT&T, Comcast and Verizon. It's a network of networks (some private and some public) that depends on a common set of rules to transport information, connect people and function. The most important rule for preserving free speech online is common carriage, the classification that prohibits these access providers from interfering with the content that flows through their pipes. Returning the Internet to the widely used common-carrier standard is what these industry types fear most. 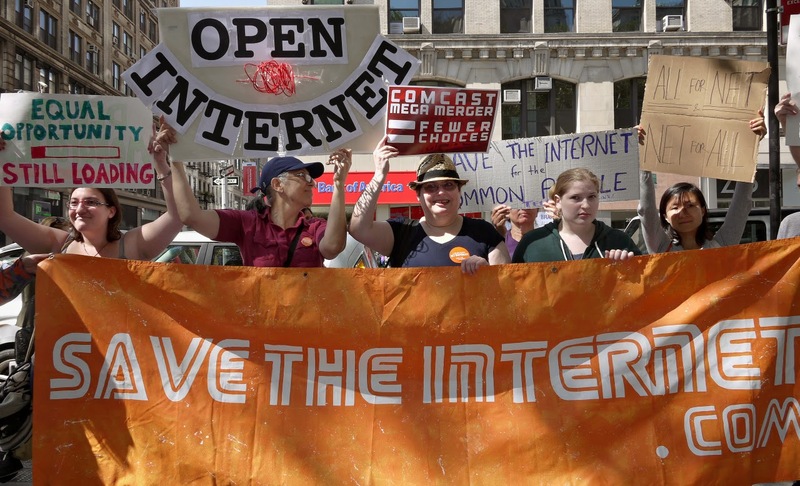 It's a fear that has reached a fever pitch after an overwhelming majority of the public urged the FCC to protect real Net Neutrality and reclassify broadband providers as common carriers under Title II of the Communications Act. The public outpouring of support for Title II has set alarms ringing at the headquarters of the National Cable and Telecommunications Association, the lobbying group that's led the industry's decades-long effort to destroy the one principle that preserves the Internet's open and democratic nature. According to established law, common carriage applies to any carrier that "holds itself out ... to carry for all people" without interference. It was originally applied to transportation like railroads and ferries, but became an essential standard for open communications. Any two-way communications network that serves the public is not supposed to block, degrade or otherwise unreasonably discriminate in the transmission of the content it carries across its networks. Common carriage extends free speech principles to privately owned networks, promoting interconnection and the widest possible sharing of content while ensuring a marketplace that's bolstered by competition. Common carriage works well across the U.S. economy. It applies to wireless carriers (like Sprint) and more than 1,000 small rural carriers (like Iowa Network Services) offering DSL and fiber access. Congress defined the common-carrier obligations of telecommunications services as transmitting information between points of users' choosing without unjust discrimination. After intense lobbying by phone and cable companies, the FCC removed broadband service providers from that classification during the Bush-era, creating the legal mess that now envelops the agency. "McDowell needs to regain some common sense about common carriage," says Marvin Ammori, a First Amendment scholar who runs an Internet policy consultancy in Washington, D.C. "Are your phone lines censored? Are enterprise lines censored? Are mobile voice services censored? All of these are common carriers. We need the same assurances with our Internet communications." The framers of the U.S. Constitution could not have foreseen a time in which technology allowed more than 2.7 billion people to communicate via interconnected digital platforms. Nor could they have envisioned a world in which companies like AT&T, Comcast and Verizon wield more authority over free speech than a British monarch. The sheer scale of free speech today is without precedent; more people than ever before are able to connect and communicate. Going forward, these Internet users need common-carrier rules, as much as the First Amendment, to protect this most democratic right. -- Originally published by PBS MediaShift.